Army Maj. Nidal Hasan has been found guilty of murder in the Fort Hood shoot deaths of 13. 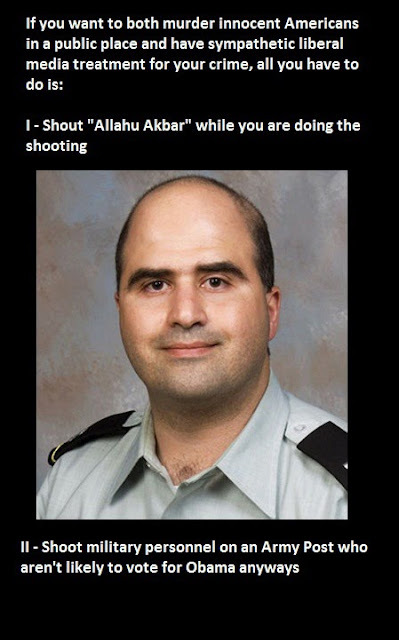 A military jury on Friday convicted Army Maj. Nidal Hasan of 13 counts of premeditated murder in a November 5, 2009, shooting rampage at Fort Hood, Texas, making it possible for the death penalty to be considered as a punishment. He admitted doing so to protect the Taliban. It begs the question; does the Obama administration still consider this an incidence of workplace violence?